A revision knee replacement surgery is a procedure for people who have previously had a partial or total knee replacement, and who now need a revision surgery to replace the surgical implants or correct a problem with the existing implants. Why Would Someone Need Revision Knee Replacement Surgery? Partial and full knee replacement surgery is designed to improve the function of a knee joint damaged by injury or disease. The surgical implants that are placed into the knee to repair it last for a long time—around 15 to 20 years—but for many people there does come a point at which the knee implants need to be replaced. This is particularly true for young people or people who are very active. There are several reasons why someone might need a revision knee replacement procedure. The existing knee implants have become infected. The existing knee implants have been in place for a long time, and are worn out and need to be replaced. The existing knee implants have been affected by a mechanical fault or are broken in some other way. In all cases, the end result is usually that the knee is less functional than it was. For instance, it can become stiff, swollen, painful, or it might be unstable. Even though revision knee replacement has the same overall goal as a partial or total knee replacement—to repair and restore an injured or damaged knee joint—the revision surgery is actually very different. Revision surgery is often a much longer procedure, and a more complicated one. This is partly because the kind of revision that's needed depends on what has gone wrong with the existing knee implants. Revision knee replacement is performed under general anaesthetic. If for some reason a patient can't tolerate a general anaesthetic, a local anaesthetic, combined with sedation, is an alternative option. 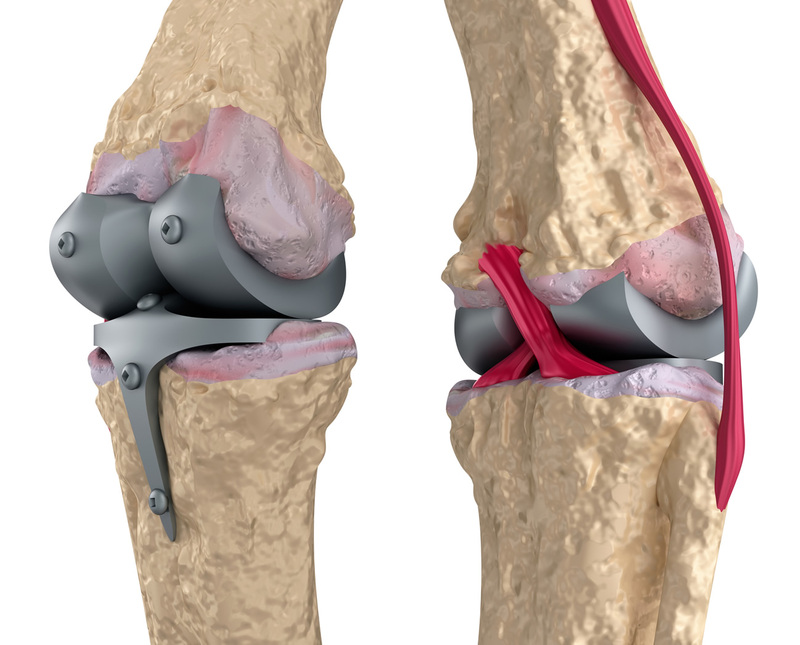 Some aspects of revision knee replacement are similar to primary knee replacement. For instance, in both procedures the surgeon must remove damaged bone and other tissue in order to make way for new implants. However, because in a revision procedure the surgeon is replacing implants with implants, it's a bit more complicated. Sometimes, for instance, only one or two of the three implants in the knee might need to be replaced, rather than all three. Another issue is that sometimes an implant that has suffered a mechanical fault causes damage to surrounding bone. In these cases the surgeon must devise a way of repairing the bone, for instance with a bone graft or metal implants that strengthen the bone. Once the surgeon has replaced the implants and added any other components that are needed, they must repair any damage that has been done to the surrounding tissues. Next, they test the newly-repaired joint to check its range of motion, before closing up the incisions in the knee. After having a revision knee replacement patients stay in hospital for several days. The recovery period after revision surgery is often longer than the recovery period after a primary knee replacement, in most other ways recovery is very similar. Most people can start walking the day after their surgery, working with a physical therapist on rehabilitation exercises. The first few weeks usually require the use of a cane or other support device to provide stability while walking. The long-term outcome for revision surgery is similar to that of primary surgery, in that relief from pain, and increased knee function and stability are likely results. However, after revision surgery some people still have some minor pain or stiffness.